As we pause at this time of year to look back on our blessings and look forward with hope for the future, I wanted to take a moment and wish all of you a very happy holiday season. I hope it is full of wonderful memories, lots of laughter and, always, big, big love! Thank you for letting me share my family’s story with you — I know there will be a lot more tales to tell in the new year. Dottie continues to amaze us with her contagious laugh, astounding vocabulary and larger-than-life personality. She is what makes this world a better place — what is going to continue to make this world a better place. And I cannot wait to bring her brother into this world. If his never-stop-moving, in-womb antics give us any foreshadowing, he’s going to be just as spunky as both of his big sisters. So, wherever this holiday season finds you, I’m sending love, hope and peace your way. I’ll see you in 2017. Today was one of those days. One of those really hard days. Where missing Penelope Joy feels so fresh. I don’t know why it was like that. I don’t know what made today different. What I do know is that there were several times when I caught myself thinking about her and missing her. Right in the middle of a meeting. And in the middle of working on a project. I even found myself driving home with tears in my eyes as I thought about our baby girl. I’m sure it has a lot to do with what’s on the horizon. Christmas was hard last year — nearly impossibly hard. This year, it’s hard in a different kind of way. We’ve settled into our grief and into our life without Penelope Joy. But there’s still a hole. And I can’t stop myself from thinking about how fun our little 15-month-old Pickle would have been — I mean, come on, that’s like the perfect age for Christmas and all its magical joy. Maybe that’s what it is. Christmas is such a magical, happy time — or, at least, it should be — that so perfectly pairs with the magic of childhood. Don’t get me wrong: I do enjoy Christmas. And I don’t hold anyone’s happiness or joy or magical moments against them. And I think everyone should embrace those things in celebration of what this season is about. But, it makes missing Penelope Joy fresh again. After some discussion, we decided to have some maternity photos taken with Sprout. We had some done with Penelope Joy, and I loved love them. But it feels very weird. We’ll basically be having family pictures without our whole family there. I suppose it will always feel strange, knowing that part of our “us” is missing. I cannot even begin to tell you the joy and excitement we have in our hearts as we await the arrival of our precious Sprout. (Just under two months to go!) It’s pretty much beyond words. And knowing that the doctors have told us our baby looks wonderfully healthy — no signs of any heart or other defects at this point — gives us even more reasons to celebrate. But every part of this pregnancy has been tinted with what happened with Penelope Joy. And as we look forward with such joyful anticipation to Sprout’s arrival, we’re reminded of our precious Penelope Joy. We finally unpacked the 14 boxes of Penelope Joy’s things. (You know, for a little girl who never got to come home, she sure had a ton of stuff!) So much of it we’ll get to hand down to Sprout — most of it brand-new, even. Can they really ever be hand-me-downs if they never were used by their original owner? We spent a lot of time on Memory Lane while we were unpacking those boxes and getting Sprout’s nursery ready. We were reminded of what we missed out on — but also were reminded of the amazing gift we’re being given with Sprout as well. It’s a weird feeling — being sad but oh-so happy at the same time. But, as time goes on, I do get more and more used to those two contradicting emotions living side-by-side in me. Sprout’s nursery is a mix of some brand-new things just for her — and some special items that once belonged to Penelope Joy. So, there’s a lot going on. A lot to be overwhelmingly happy about. And some things to be sad about, too. That’s probably why today was one of the hard days. There’s a lot going on — and there’s a lot coming up. And mixed emotions (combined with pregnancy) can be exhausting. I know not every day is going to be hard — and not every hard day will be completely hard. I also know that it’s OK to have hard days and it’s OK to be sad. And I know that the sadness does not — in any way — diminish the joy in my heart about Sprout. Nor does that joy diminish my love for Penelope Joy. The family gathered ’round the tree. A book, a cue ball — a bracelet, too. A new RoadID — complete with new name and new emergency contact number! We bought gifts for those who might not have any. Admittedly, I probably had more fun shopping for an infant boy than for my grown-up husband. And headed back to bed to eat. Blueberry pancakes (and one with gummy bears, too), bacon and tea. Down the street, into the cold. “We’re on our way, we’re coming down. Mr. B then left for work. I cried and cried like a mopey jerk. And Mom and Dad came in the frame. Two of my most favorite people. Leaving this Mrs. B so sappy. Just long enough to talk and sit. They had to go and visit others. When I get to run, it’s hard to pout. Christmas runs deserve a skirt. Just me, myself and winter’s bite. I found snow on my run! And mile six turned quite speedy. To see the lights of this cute town. They wrapped around my favorite dam. So glad I had my telephone cam! And realized ’twas the dinner hour. And enjoyed my quiet Christmas meal. Even our Christmas trees had some FaceTime! We talked and laughed and had some fun. Then, sadly, good-bye had come. I still needed to call the rest of the crew. Family is what I hold most dear. A little misty, around the eyes. Then the time finally came to await Mr. B. Work was ending; he was coming home to me. We were all eagerly awaiting Mr. B’s arrival home. So Christmas had come, and quickly it went. Our first married Christmas we had so spent. Being apart, yeah it was tough. The future has lots of Christmases in store. But I still got to hug Mr. B tight. And that, in itself, is a gift I adore. His love, his sweet hugs, you can’t buy at a store. My life is so full of gifts oh-so nice. But I’m still the most blessed girl in this land. I have love, I have light, I have the very best life. I’ve got family and friends — and I’m Mr. B’s wife. As we sit down to celebrate Christmas with our family and friends, I’d like to share a quick note to those who are already looking ahead to 2013 with hopes of taking control of their health and fitness — once and for all. Welcome! I know this was a big, scary step for you to take after all these years of saying “tomorrow’s the day.” I know because I’ve been there. It wasn’t the new year when I took that first step in to the gym. But, for me — like for you, it was a brand-new start. I’ve walked in your shoes, and I know that it can be hard to take that step, wondering what those other people must think of you when you walk through that door. But, don’t be too scared. Most people in the gym are there for the same reason: To take control of their health and to reap the benefits of exercise. Now, you may hear people bemoaning the presence of the “Resolutionists.” I won’t lie to you: it’s true that some people will roll their eyes or make snide comments about your presence in the gym, knowing that many who “start fresh” on Jan. 1 don’t last through February. But, I also promise you: it’s not everyone. Some people will welcome you to the gym and provide encouragement and advice (sometimes unsolicited). A majority, though, will go about their business, lifting weights, running on the treadmill or punching the heavy bag. They probably won’t even know you’re there. Because when they’re in the gym, they are there to do work — and, truthfully, they don’t care what anyone else is doing. That last type? That’s me. I do know it’s scary to go to the gym alone because you’re afraid everyone’s looking at you, judging you. Rest assured, they’re not. Most people are like me: They want to get a good workout in, so they’re really not judging (or even noticing) the other people who walk through the door. Learn the gym’s rules. If there’s a 30-minute limit to the cardio equipment, observe it. If you have to pre-register for a spin bike, do so. If there are certain lockers reserved for specific members, don’t use them. Learn the “culture” of your gym. There’s a certain cycle/personality of every gym at different times of the day. For instance, I’ve learned that I’d rather lift in the morning because that’s when people are less chatty and more business when it comes to the gym. And I seldom have to push through a crowd of gossiping guys (and, yes, at my gym, it’s always the guys) to get to the weight bench. It may take time to really figure out the pulse of your gym, but you’ll be glad you did. Use common courtesy. Don’t stand around blocking equipment while you’re chatting or resting or (for whatever reason) texting/gabbing on the phone. Be aware that there are other people in the gym, too. And be respectful. Oh, yeah, please (dear, God, please) wipe down the equipment after you use it. Take advantage of the gym’s resources. Many gyms offer information, get-to-know-the-gym sessions, classes and nutrition resources that will help you reach your goals. What’s even better? Most of it is free. Learn how to use the machines or weights or whatnot. If you don’t know how, ask. You’ll save yourself a lot of time — and injury. There is gym staff for a reason. And, if they’re not helpful, find another gym (if you can) where they are. Other gym-goers will most usually help when you ask them — as long as you do so courteously and appropriately. Have confidence. Know that you’re there for one reason alone: you. And have faith in your own strengths and abilities. One thing about this new life you’re stepping into: You’ll quickly learn that you’re stronger than you ever imagined. Forget them. Stop worrying about what other people in the gym are thinking about you and do what you know needs to be done. Once you get past that “ohmigoshwhataretheythinkingaboutme” hurdle, you’ll have a much more pleasant gym experience. Trust me. As soon as I realized no one really cared what I was doing in the gym (unless I was in their way), I stopped dreading the trip and started looking forward to it. Don’t quit. You’re not going to be perfect at everything you attempt in the gym. I’ve failed at a lot — T2.5 often has to teach and reteach (and reteach) me how to do a lot of things. As someone who strives (STRIVES!) to be perfect in everything, this is hard for me. But, I grow so very much in the learning that it’s worth every failure when I finally succeed. So, please, please don’t give up. Love yourself to know — truly, deeply — that this is the best gift you could give yourself. And you are worth the work and the time and the money. So, please, try not to be too nervous about the gym. I know that it can seem to be an intimidating place. But, once you get to know your gym, you’ll grow to love it and the feelings of empowerment and strength it can help you realize. And, if you ever doubt your strength — or your place in the gym — tell yourself, “I am worth this. I deserve this. I belong here.” Because you are, and you do. I’m not an expert by any means, but I do know about my experiences (and my successes and my failures). And if you’d like to reach out and ask questions at any point along your journey, I’d love to answer them. P.S. I’m really proud of you for setting these goals and making this commitment to yourself. You deserve only the best, and I’m excited to see how far you can go! Presents are nice, but so is your presence. If there’s one thing that makes me uncomfortable, it’s the giving of gifts for the sake of a season. Don’t get me wrong — I love giving gifts and, yes, receiving is fun, too. But I prefer a random care package sent on a Saturday in June to a gift that, well, might be more than you can afford on a specific day because that’s what our society, our culture, dictates. * That being said, I always graciously and loving accept gifts because it’s important to the giver — and what’s important to the giver is important to me. Besides, like I said, getting presents is fun. But, what I want? What I really, really want? For the first time in many years, I am full. And my cup? It runneth over. You see, I already have the things that money can’t buy: health, happiness, love, joy, peace and hope. I have family and friends whom I adore; I have a love in my life that’s bigger than any I’ve ever experienced; and I have the gift of another day. Though, I guess you could say I do want something: I want more time with my family and friends; more time in the arms of Mr. B; less anger, less stress, less hate in the world. I want people’s suffering to end. I want a cure for Alzheimer’s and cancer and all of the horrible diseases that take people too young. I want comfort and joy and peace. And those things can’t be purchased on Black Friday — I don’t care how much money you have. So, this year, instead of making a list, I’m going to ask you to think about me, think about what you know about me. And if you’re so inclined, pick something up that you know I’ll just love — please do, as I’m certain a gift from your heart will warm mine. But, if you’d like to go another route, I ask that you please put your money to use doing something bigger. I ask that you make a donation to the Alzheimer’s Association — or a cause that’s close to your heart. Spend your money where it will do good. Because that gift? It is a gift for all seasons. *Please note: Birthdays are a whole different deal all together. I love my birthday (month), and I love you for loving it, too. Where in the World is Kimi Joy? OK, so I’ve been quiet. I’m sorry — I really do miss writing and “talkin’” with all of you. But, sometimes when my heart is heavy all I want to do is write. Other times, my muse hides away in the deepest caverns of my soul and comes out when she’s darn well good and ready. Plus, I have been on vacation. And it was busy — and fun. Here’s a quick top 10 13 of the things I’ve been doing. I’ll be back later with full recaps on vacation, skydiving (!) and my 15k race. 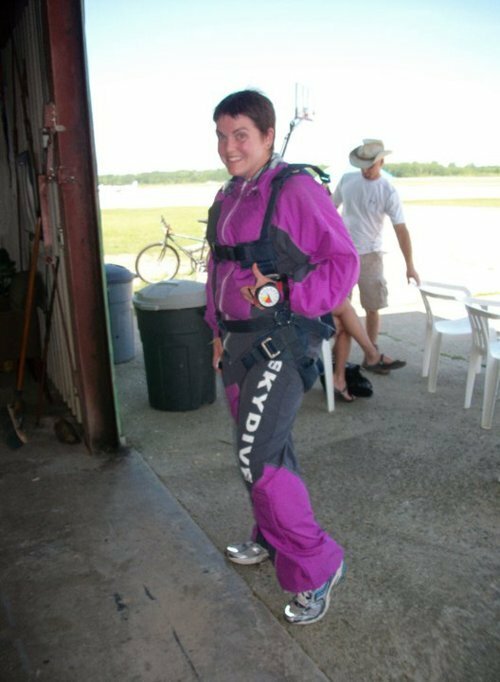 I went skydiving. Holy crap, I still can’t believe I did it! I spent some lazy beach time — and didn’t feel self conscious in my suit. At. All. Win, win, win, win, win. I worked on the farm — at our market and in the cherry trees. I ate way too many cherries to count. I spent some much-needed time reading for fun and chilling out in the sunshine (lathered with my SPF 50, of course). I ran. Even returned home to fit in a bootcamp session. I spent one-on-one time with Mom and with Dad. I needed it. So did they. There may have been some crying. I got to play lots with my nieces and nephews. Family time is (mostly) fun time. I went on a boat and visited with my brother. RB was there, too (of course)! I helped build a grill. I caught up with some of my oldest and dearest friends. I ran a 15k race during the National Cherry Festival. There was a very big hill. The instructor even picked a fun color for me! Hey! 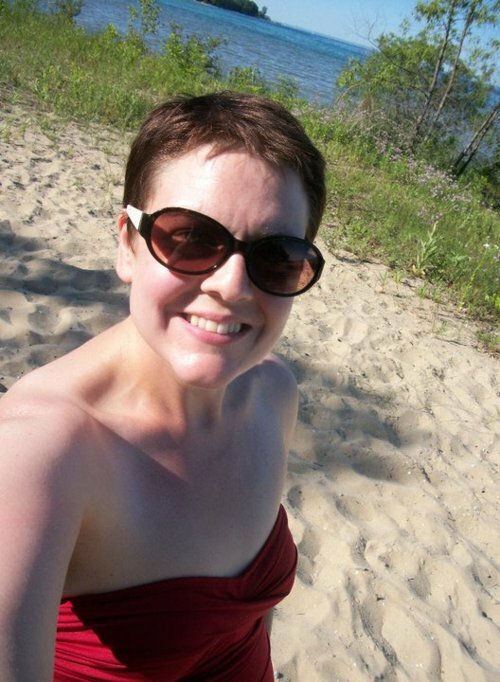 Guess who didn't feel self-conscious walking around on the beach in just her bathing suit! 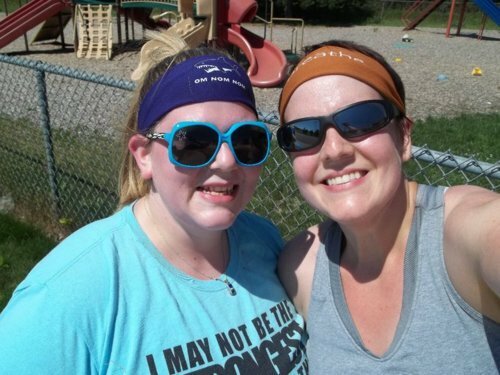 A very sweaty mini-bootcamp session with my sister was just what the doctor ordered. 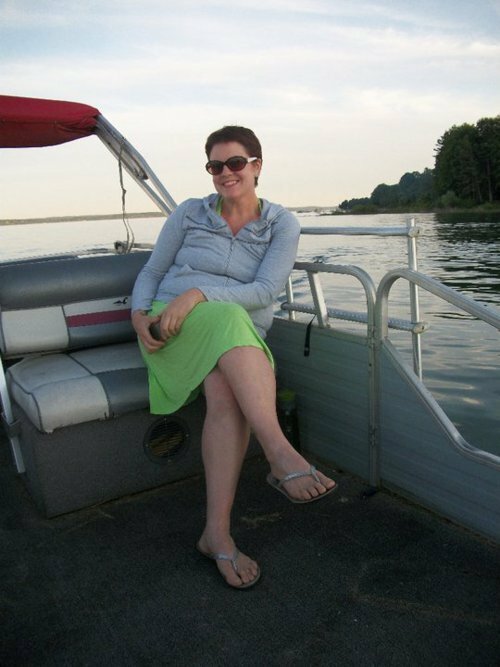 Loved getting to hang out on the boat (however briefly) with my brother and sister. Look, Ma! 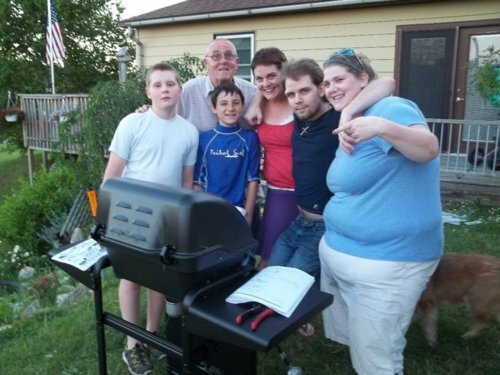 We built a grill for Grandma! *Special thanks to Cherry Bay Orchards/Shoreline Fruit for allowing us to be part of their team — and for taking this rockin’ picture of us by the big cherry. Overall, it was a pretty productive day — well, I enjoyed it anyway. My cats? Notsomuch. The cats were not impressed with my NYE plans. Oh well, can't please everyone. Things were not looking good for a race today. Woke up and it was almost 50 degrees — nice, but so not Michigan winter. Then came the thunderstorms! Yep. Thunder. And pouring rain. I’ll run in the rain. Heck, I like running in the rain. It’s relaxing. I like running in the snow. It’s a calming kind of solitude. But I refuse to run in pouring rain that is accompanied by thunder. So not cool. Got everything ready nice and early, despite the rain, so I could enjoy my day. But, the rain cleared, taking the thunder with it. Got my blood drawn, got some groceries and went about my daily business. The weather stayed pretty good. No more rain. And warmish. So, I put on my capri-length running pants, a tank top and a long-sleeved shirt. No gloves or hat needed. Left my jacket in the car, too. For some reason I was really nervous starting this race. I don’t know why. It was a weird feeling — my fingers shaking just a tidbit while pinning on my bib. Maybe it was just excitement, not nerves. I started the race, and it was perfect — the temperature was great, the crowd was crazy big and it felt good. But, somewhere in the middle of mile 1 the hills started. No one said there’d be hills. 🙂 They weren’t big, but they definitely caused me (and the other runners) to slow a bit. But on I ran. Passed some people. Some people passed me. This went on for most of the race. I picked out a few people to help pace myself but ended up passing them about halfway through. But then it started raining. And it was a cold rain. The kind that chills you through your bones. But on I ran. It felt good for about the first 5 minutes. Then it was just cold and wet — I wasn’t dressed appropriately for cold, wet rain. But on I ran — right to the finish line. My final chip time for the four-mile race? 40:12 — a 10:03 mile. I’m pleased with this, considering the hills and the rain. Besides, I’m happy every time I finish a race because, dadgummit, I ran. And that’s what matters. Post-race dinner: Turkey burger with locally raised, nitrite-free bacon and avocado, with a side of steamed veggies. There were no mile markers on the course anywhere. And people holding the traffic had no idea how far we were into the race at various points. I did not know that area of town well at all, so the only thing I had to judge my distance was the time on my watch and how I was feeling. It was both a positive and a negative. I was able to focus on my running rather than on how far I’d gone or how far I had left. I was able to set a pace that felt good, that felt right. But I had no idea where I was or how much race was left or how I was doing. That was annoying. There also was no water along the course. At all. I didn’t really feel as if I needed it, but it would have been nice to have the option. There were two jugs of water at the end of the race that were almost gone when I got there — and half of the runners still had yet to cross the finish line. And the most annoying thing of all — the thing that caused me to leave the race in a pissy mood? They served Washington apples. I’m sorry, but we live in Michigan — one of the top apple producing states in the country. And, our county is Michigan’s apple capital? And you serve from-storage Red Delicious apples shipped in from Washington state. That’s unacceptable to me. They will be receiving a letter, as will the local paper and the Michigan Apple Committee. I’m honestly disgusted. This race was put on by a Michigan company and sponsored by a Michigan shoe manufacturer and they can’t support local farmers? Besides, apples from storage (particularly Red Delicious) are nasty. I may be a bit partial, as I am the daughter of a fourth-generation fruit farmer — fruit farming’s in my blood. And I am a STRONG supporter of buying local. But, really, it just makes sense on so many levels. Buy local, folks. Buy local.